During our 4 years in Japan, we celebrated Thanksgiving with our multicultural group of friends who became our family in Tokyo. For some, Thanksgiving was not a part of their holiday calendar, so we had the unique experience of giving people their first taste (literally) of this holiday. The first year, I attempted to cook everything by myself in a tiny kitchen with no oven. To make it even worse, I wouldn't let anyone help with the dishes after dinner. Instead, I hid all the dirties under the kitchen sink and waited until everyone left to clean up. Rookie mistake. There was also a situation involving a 20+ pound turkey and a bicycle. More on that at a later date. And if you're lucky, I'll share the video documenting the insane logistics of pulling off a Thanksgiving celebration in Tokyo without an oven or, perhaps more importantly, a car. One of the dishes I handed off after that first fateful Thanksgiving was cranberry sauce. To be honest, I'm not sure we even had it the first time around. Our friend Danny took on the sauce-responsibility and reminded me that cranberry sauce does not need to look like a congealed metal can mold, complete with ridges and an eery jiggle. Cranberry sauce can in fact be very beautiful and full of wonderfully fresh, complex flavors to offset the heavy, rich offerings Thanksgiving brings. Danny always put ginger in his cranberry sauce, which I have also done with the recipe sharing today. I kept it pretty simple, adding only whole cloves for spice, a couple strips of orange zest, and a sprig of rosemary. To keep a little bit of Japan present at our table, I added sake as the main liquid. The sake is mild, which is nice because it does not overwhelm or hide the other flavors. Instead, it brings them out even more. I'm thankful for the Thanksgiving meals we shared with our friends in Japan. The memories we made are always with me, reminding me that there is always a reason to be thankful no matter where you are or who you're with. 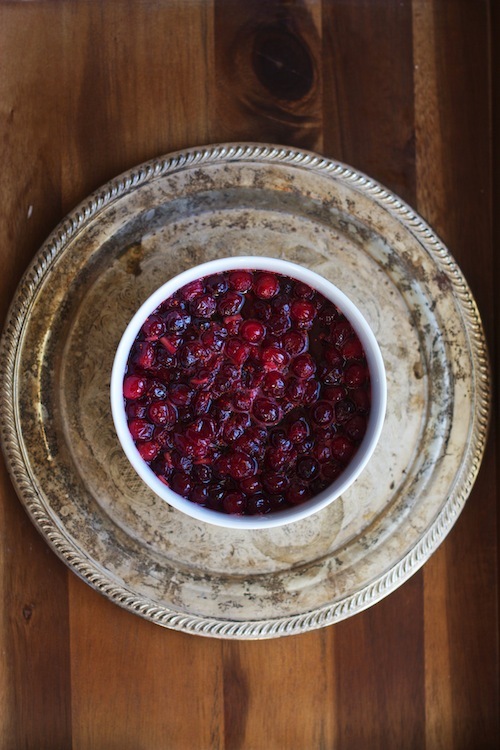 So to kick off this week of Thanksgiving recipes, and to give a shout out to our Tokyo family, here is a cranberry sauce recipe that is easy, flavorful and acts as the base for recipes to come on Wednesday and Friday this week. So stay tuned! More to come! I would recommend reserving some of the liquid just after the sauce is done cooking. I'll be using it in a cocktail later this week that I think you'll enjoy! Wrap the cloves, rosemary, and orange zest strips in a piece of cheesecloth tied together with kitchen twine. Combine the cranberries, ginger, sake, sugar, and orange juice in a saucepan and bring to a simmer, stirring to combine. Continue to simmer for about 10 minutes or until the cranberries have burst and begun to shrivel just slightly. Remove the cheesecloth packet and discard. Pour the cranberry sauce into a serving bowl and let it cool to room temperature. Cover with plastic wrap and refrigerate until ready to serve. The sauce can be made and stored up to 3 days ahead.